COMMENTS: These puppies are a big hit with moms with kids. I like to make the pups a different color than the rest of the cavity. I have created some great Good Dog Soaps. Learning to fill just the dog part of the cavity is challenging but with practice, it's getting easier. Children really like these soaps. COMMENTS: So cute for kids's soaps and dog lovers. COMMENTS: I like milky way molds so I am very pleased. I have some animal molds and have provided some of the local vets with soaps for the pet owners and animal lovers. 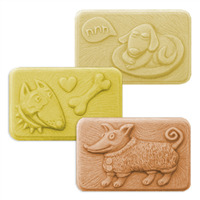 These dog soaps have been very popular. The bar is 4.25 oz which is the size I like to use. I have had great luck with milky way molds and find them easy to use and clean. "How many oz is each bar?" "this one mold makes 2 bars of soap? there are 3 bar designs shown. How can i get 3 designs from a mold that makes 2 bars? " 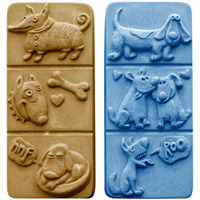 Staff Answer The Good Dogs 2 Soap Mold (MW 171)has three different designs per mold. They are the designs that are pictured on our website.